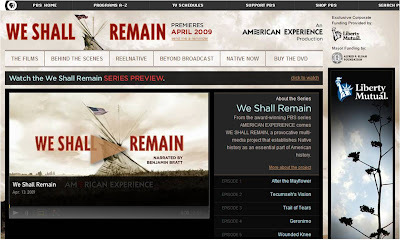 Speaking of History...: Podcast #186 - Review of Upcoming PBS / American Experience Series "We Shall Remain"
Podcast #186 - Review of Upcoming PBS / American Experience Series "We Shall Remain"
Hello. This month I have the privilege of hosting the PBS blog "Media Infusion" and discussing the upcoming PBS and American Experience series "We Shall Remain". The series will be shown on PBS stations beginning in mid-April 2009, check your local PBS station for dates and times. "We Shall Remain" describes the Native American story within the context of American history. Each of the 5 episodes are unique and the entire 7.5 hours of content is excellent. In the podcast I discuss the series and how a teacher could approach it for use in class. 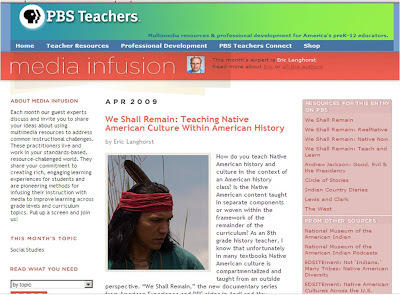 I also encourage you to read the Media Infusion blog post and leave a comment during the month of April describing how you incorporate Native American culture in your history class. Direct link to Podcast #186 - Review of PBS / American Experience Series "We Shall Remain"
What Does A "Trillion" Look Like?